Harrogate Town defender Warren Burrell insists that Harrogate Town are overdue a win against Salford City. The Wetherby Road outfit have lost each of their previous three encounters with the Ammies, despite producing decent performances on each occasion. They went down 2-1 both home and away during 2017/18 as City pipped them to the National League North title, following a battle for top-spot that raged until the final weeks of the campaign. Then, despite twice taking the lead at the Peninsula Stadium back in November, Town ended up on the wrong end of a 3-2 scoreline the last time the sides met. "We've played well against Salford in the past and there's only ever been one goal in it, but ultimately being the better team counts for nothing if you don't win," Burrell said ahead of Wednesday night's televised National League clash between the two promotion-hopefuls. "We need to make sure that we get a result. We're definitely due one, but we know it's not going to be easy. "They've got a squad full of quality. They've got lots of players who can hurt you, they're a big unit and they're a real threat from set-pieces, so we will need to take our chances and also keep them out at the other end. "It's a big game, but we won't treat it any differently because it's against Salford. The fact that we are both in the play-offs and aiming for promotion, that's what makes it massive." Town boss Simon Weaver has said during the build-up to the fixture that he expects his players to thrive in front of the live BT Sport cameras, and Burrell is of the same opinion. 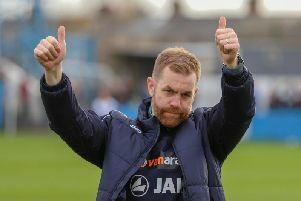 "The boys have enjoyed playing on TV this season, we played very well against Hartlepool and we're looking forward to doing it again," he added. "We produced a good display and rose to the occasion last time and this is another huge game where I expect us to do the same." Wednesday's encounter kicks-off at the CNG Stadium at 7.45pm. Tickets for the game have sold out.